Philip Liston-Kraft studied piano as a young boy at the New England Conservatory with Jeannette Giguere and Russell Sherman. As a teenager, he performed Liszt’s First Piano Concerto with the Boston Pops Orchestra. He graduated Harvard College with a degree in biochemistry and music. Since 2001, he has been one of the “Lawyers in Love with Music”—a musical group appearing annually in Provincetown. 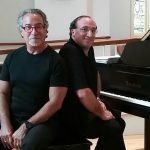 In the past five years, he and Mr. Weiser have regularly performed music for piano duet at venues in Boston, Hanover, NH, Baltimore, MD and Asheville, NC. He has been a German instructor in the Rassias Language Program at Dartmouth College since 2005. Dr. Liston-Kraft is a graduate of Tufts University School of Medicine and Harvard Law School and is currently Corporate Counsel at Biogen. He has also been a competitive ballroom dancer. He currently resides in Revere, MA and also in Chatham on Cape Cod.